Hurricane Pass, Grand Teton National Park. The hike to Hurricane Pass (elevation 10,338 feet) is without a doubt one of our favorite Grand Teton National Park hikes, and we highly recommend it for anyone to who's in reasonably good physical condition. 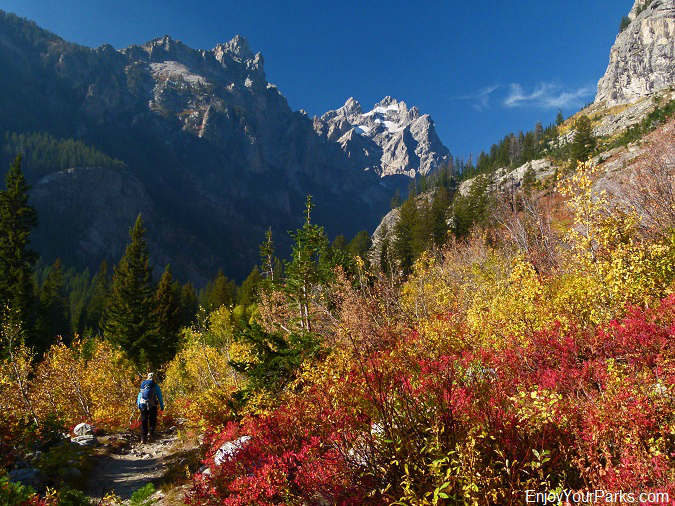 This scenic 10.9 mile Grand Teton Park hike climbs 3,468 vertical feet as it works its way up the South Fork of Cascade Canyon and eventually lands you on Hurricane Pass, which is 10,338 feet above sea level. The trail to Hurricane Pass in Grand Teton National Park takes you literally "behind" the massive peaks of Grand Teton, Middle Teton and South Teton, which provides an incredibly unique view of these iconic mountains from the west. The trailhead to Hurricane Pass is located at the String Lake Area of Grand Teton National Park. As you turn into the String Lake Area, the trailhead is located at the very first parking lot to your left. There you will find the large trailhead sign. 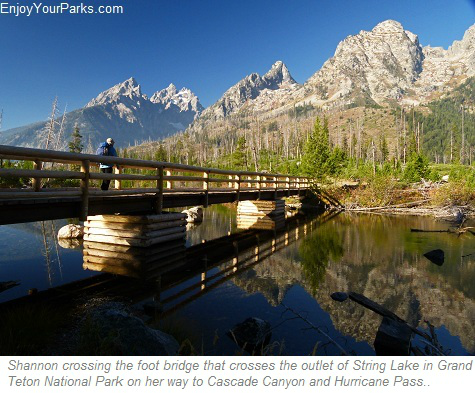 You'll cross a large foot bridge across the outlet of String Lake as you begin heading south toward Cascade Canyon. Now of course there are other ways of getting to Cascade Canyon, such as the hike around the west shore of Jenny Lake. The trailhead to this hike is located at South Jenny Lake, and is called the Cascade Canyon Trail. This way takes much longer for several reasons. One is the fact that it's an extra 1.8 miles, and you are going to be hiking on the busiest trail in the park. Furthermore, you will more than likely run into some "congestion" near the Inspiration Point area, which will also slow you up. 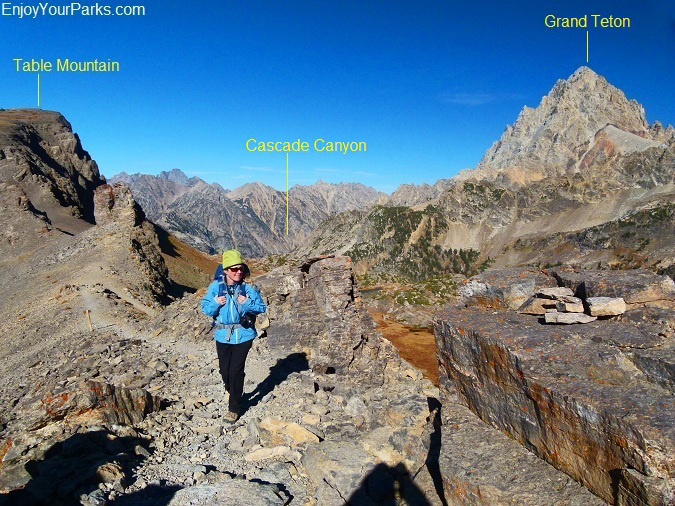 Therefore, we have found it to be much quicker to take the South String Lake Trail to Cascade Canyon, via the horse trail short-cut (discussed below). shore of Jenny Lake, where you will follow the lake shore for slightly less than a mile. At mile 1.7 you will reach the Horse Trail junction. This is a great short cut so you can avoid the Hidden Falls and Inspiration Point Area... the hike to Hurricane Pass takes most of the day, and you don't want to have distractions that will eat up a lot of time. So take the Horse Trail to save distance and time. In about 0.8 miles this horse trail will meet up with the main Cascade Canyon Trail. Go right at this junction and begin hiking up this amazing canyon towards the west about 3.3 miles to the Cascade Canyon Forks. You will literally walk right below Mount Owen (to your left) as you hike to the Cascade Canyon Forks. The scenery along this section of the hike is wonderful as you hike along the north banks of Cascade Creek. Make sure to keep an eye out for moose hanging out in the willows that surround Cascade Creek- it's always a bonus when you get to see these amazing animals. Shannon hiking through Cascade Canyon in Grand Teton National Park. Mount Owen looms above her to the southwest. Cascade Canyon is one of the major canyons in Grand Teton National Park. This large canyon was carved out by a gigantic valley glacier thousands of years ago. The Cascade Canyon Trail works its way up the middle of this incredible valley toward the west, following Cascade Creek and being surrounded by huge mountains on both sides of the valley the entire way. This section of the hike is very scenic as well as quite flat, gaining very little elevation as you approach the Cascade Canyon Forks. Cascade Canyon is a broad, glaciated canyon with towering mountains on each side. Shannon is heading for those mountains in the distance...that is where the Cascade Canyon Forks are located as she hikes to Hurricane Pass in Grand Teton National Park. Canyon Forks. 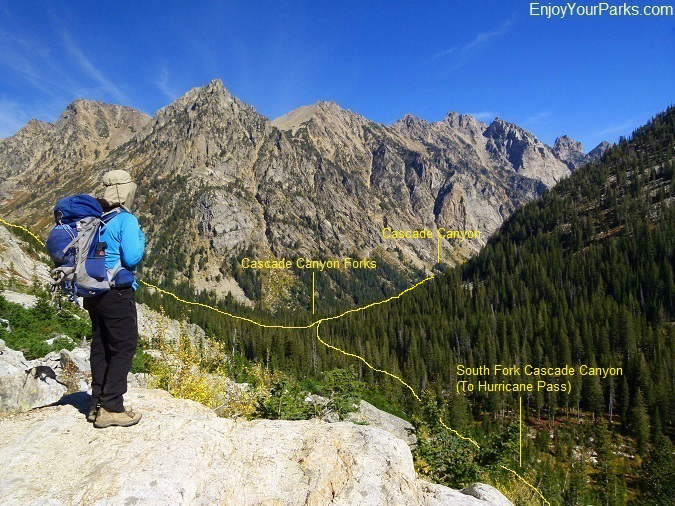 The North Fork of Cascade Canyon takes you to Lake Solitude and Paintbrush Divide, whereas the South Fork of Cascade Canyon takes you to your destination- Hurricane Pass, which is now 5.1 miles ahead. 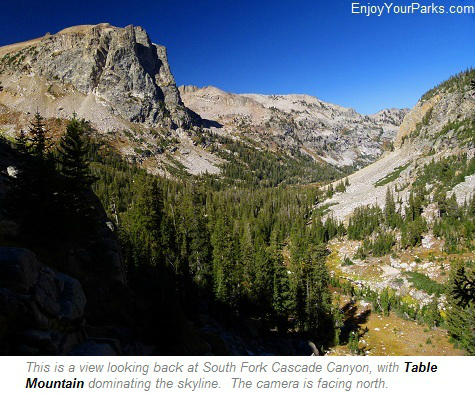 So take the South Fork of Cascade Canyon (left) and continue hiking. Up to this point the trail does not climb a lot of vertical elevation. The elevation gain is quite gradual up to this point, which is great but this also means that the elevation gain is coming. The trail will follow the South Fork Cascade Creek for the next 3 or so miles, and the views from this section of the hiking trail is very interesting and wonderful. As the trail begins to climb, make sure to look back at the main Cascade Canyon... it's quite a sight. This is a view along the South Fork Cascade Canyon Trail looking back at the Cascade Canyon Forks to the north. This trail continues onward to the south until it eventually leads you Hurricane Pass in Grand Teton National Park. Not far beyond the Cascade Canyon Forks junction, you will enter the South Fork of Cascade Camping Zone. These backcountry campsites are found throughout the next 3 miles, and they are used by overnight backpackers who are on their way to somewhere or returning from somewhere, whether it be the Death Canyon Trailhead or Paintbrush Canyon Trailhead, or somewhere even further away. Please remember that permits are required for anyone camping at these campsites. 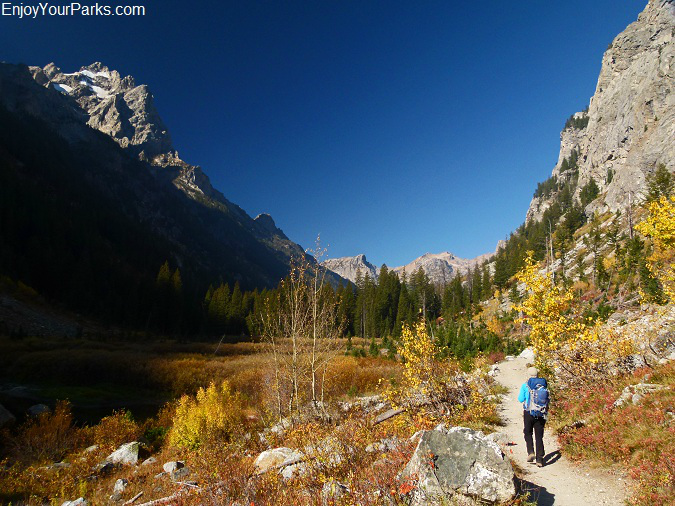 As you continue to hike along this spectacular Grand Teton National Park trail along the South Fork Cascade Creek, the views become more and more dramatic. Not only do you get quite a view of the main Cascade Canyon to the north, but you will also get an interesting glimpse of Mount Owen, as well as a tremendous view of the east face of Table Mountain (to your right) as you hike directly below this sheer wall. The trail continues to head south, slowly gaining in elevation and in beauty. The landscape begins to really open up, and you begin getting a glimpse of the giant Tetons to the east. As you continue to hike upward along the South Fork Cascade Canyon, the views become more and more amazing. As you look back on this gorgeous valley to the north, Table Mountain really dominates the skyline and creates an incredible backdrop. 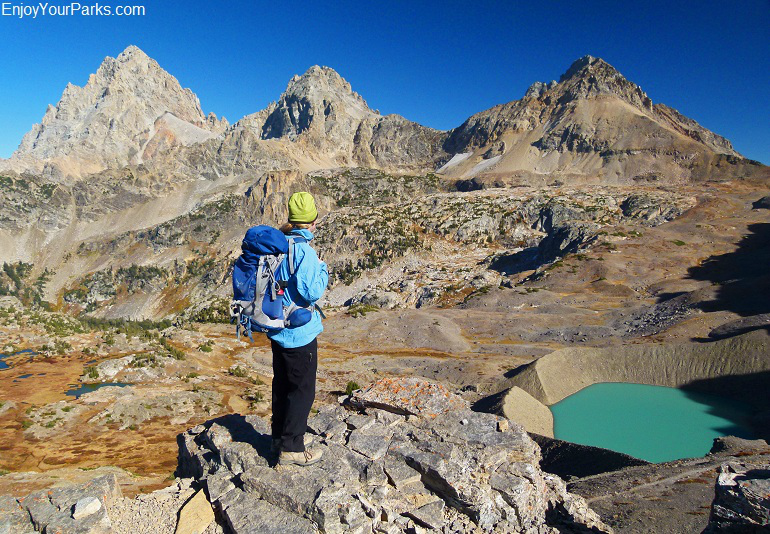 This is truly a glorious section of this hike to Hurricane Pass in Grand Teton National Park. At about 3.8 miles beyond the Cascade Canyon Forks, you will reach the Avalanche Divide junction. 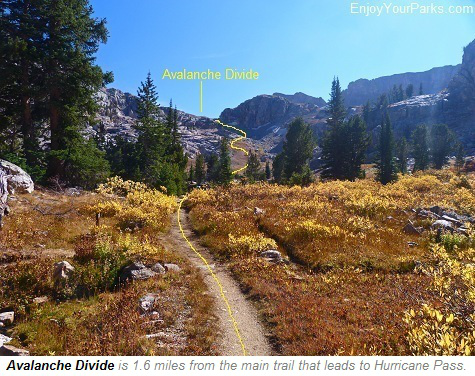 The hike to Avalanche Divide is a 1.6 mile one way dead-end trail and is very scenic. IF you feel you have plenty of time to take this detour, then by all means take it. But this will eat up quite a lot of time, so plan on leaving for the hike to Hurricane Pass right at dawn (if not earlier) if you plan on visiting Avalanche Divide as well as Hurricane Pass. We have found it best to explore Avalanche Divide another day so you can spend more time enjoying Hurricane Pass without being rushed. Hurricane Pass is 1.3 miles from this junction, and there is a glacier you are going to want to explore on your way to the pass, which also takes time. As the trail begins to head straight west towards Hurricane Pass, the view of the Tetons begin to really get dramatic. In this photo Grand Teton and Middle Teton are beginning to show themselves, and in just about a quarter of a mile, all three Tetons dramatically emerge to the east. As you get closer and closer to Hurricane Pass, the view of the Three Tetons (Grand Teton, Middle Teton and South Teton) to the east become more and more spectacular. Note the colors of the vegetation... this photo was taken in early October, when the fall colors are really in full swing. 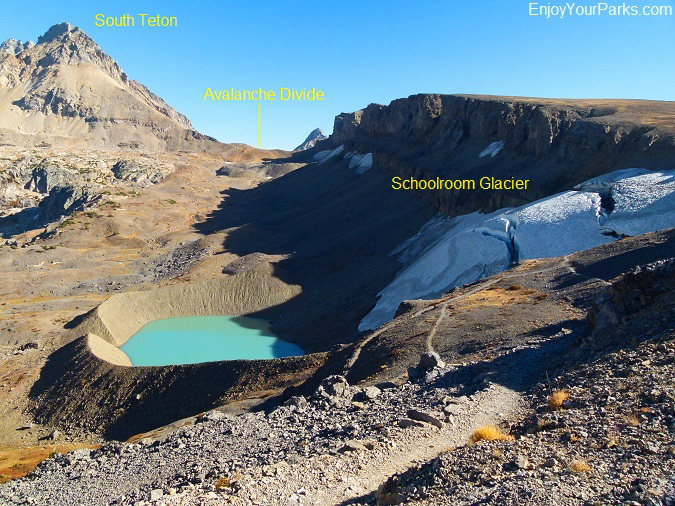 A special treat along your final approach to Hurricane Pass is Schoolroom Glacier. This small alpine glacier has it all- crevasses, lateral moraines, a terminal moraine and a splendid proglacial lake. Schoolroom Glacier is a "text book" alpine glacier, so we're guessing this may be where the name "schoolroom" comes from. 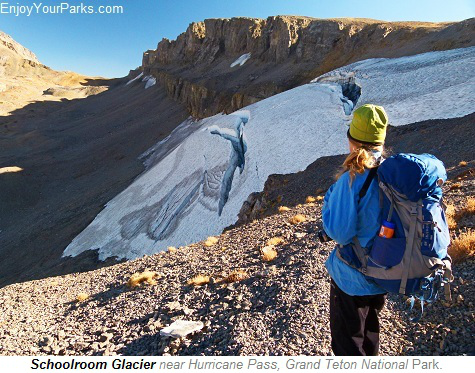 You will notice some hiker's trails that get quite close to the glacier, so by all means go explore the area. HOWEVER, we strongly recommend that you DO NOT climb on the glacier... this can be extremely dangerous and can result in serious injury or death. In other words, look but don't touch! This is another view of Schoolroom Glacier from the trail to Hurricane Pass in Grand Teton National Park. The aqua-colored lake below the glacier is called a "proglacial lake", and is surrounded by glacier moraines. Notice Avalanche Divide in the distance (south). All in all, the trail does a really good job working its way up to Hurricane Pass so you don't "feel" the elevation gain as much as you could have. Overnight backpackers appreciate this more than anybody. A well designed trail definitely makes any hike more enjoyable! If the wind is blowing, which it probably will be, before you reach the pass we recommend that you put on your wind gear because once you're on top, the wind can be outrageous. This high wind can make it unpleasant to rummage through your pack for your wind gear, and if you let go of it, it will fly all the way to Grand Teton Peak! 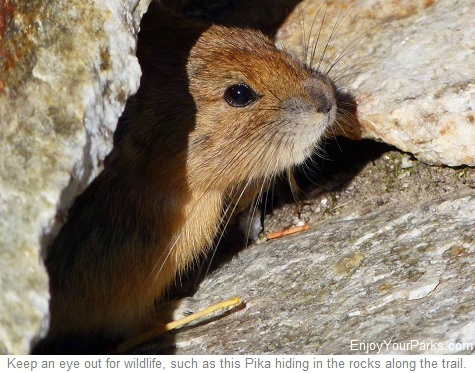 And this is an important point: Whenever you are hiking to divides or passes in Grand Teton National Park, make sure you bring proper clothing for the extremely windy conditions. And if it's cold out, make sure you bring warm clothing for under your wind gear, including a face mask, hat and gloves! Shannon enjoying the view from Hurricane Pass in Grand Teton National Park. 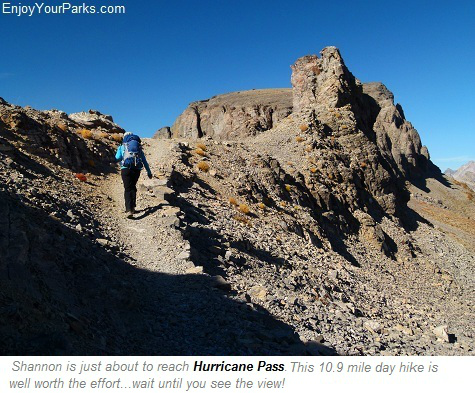 The 10.9 mile hike to Hurricane Pass is well worth the effort- as you can plainly see! 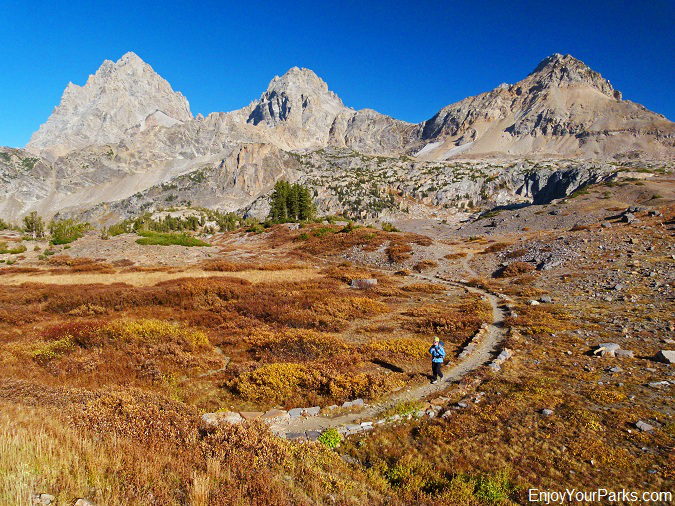 The hike to Hurricane Pass is one of our favorite Grand Teton National Park hikes with good reason. At 10,338 feet above sea level, the views from Hurricane Pass are absolutely breathtaking to say the least. To the east are the three massive tetons- Grand Teton, Middle Teton and South Teton literally touching the sky. To the west are vast areas of smaller mountains and shelves of the Jedediah Wilderness that eventually reaches the fertile farmland of Idaho. To the north you'll see Table Mountain and many other mountains, and if you hike a few hundred yards along the trail that leads to Alaska Basin to the south, you'll get a great view of the mountains to the south. It's truly a wondrous sight that you will most definitely enjoy. This is a view to the north from Hurricane Pass in Grand Teton National Park. Notice Cascade Canyon far down the valley... After you enjoy the view from this incredible place, you'll then need to hike back down to get to Cascade Canyon and eventually your vehicle parked at String Lake. Beyond Hurricane Pass... Alaska Basin, Static Peak Divide, Death Canyon Trailhead. 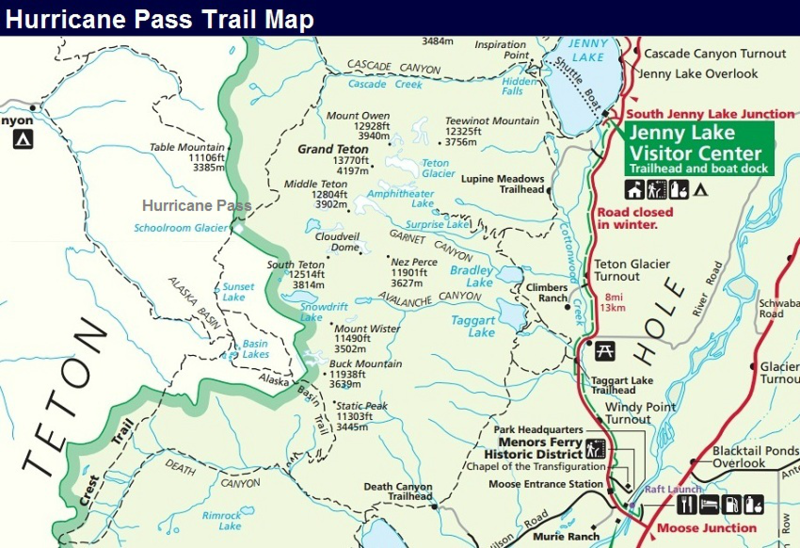 For overnight backpackers, the trail does not stop at Hurricane Pass but actually continues southward along what is known and the Teton Crest Trail. 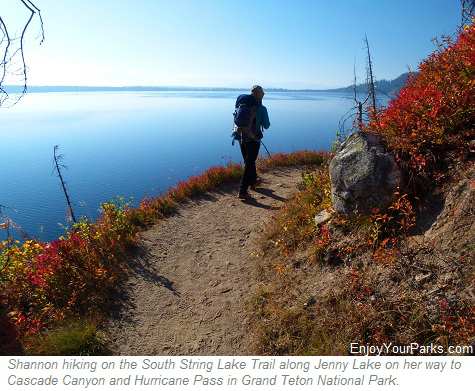 This remote Grand Teton National Park trail takes you to Sunset Lake (1.7 miles from Hurricane Pass) and the Alaska Basin. From there many overnight backpackers will hike their way to Static Peak Divide (5.4 miles from Hurricane Ridge) and eventually end up at the Death Canyon Trailhead (13 miles from Hurricane Ridge) where hopefully they will have a car waiting for them. The total distance between the South String Lake Trailhead and Death Canyon Trailhead is 24.0 miles. 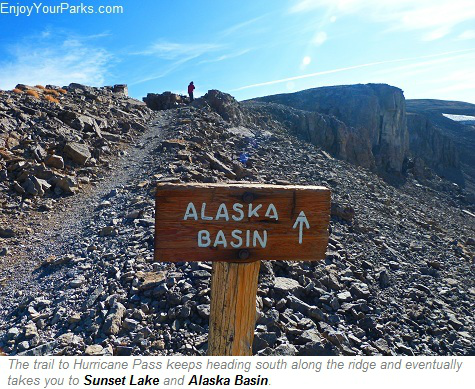 The Alaska Basin area is very remote and is usually only visited by hikers on multi-day backpacking trips. 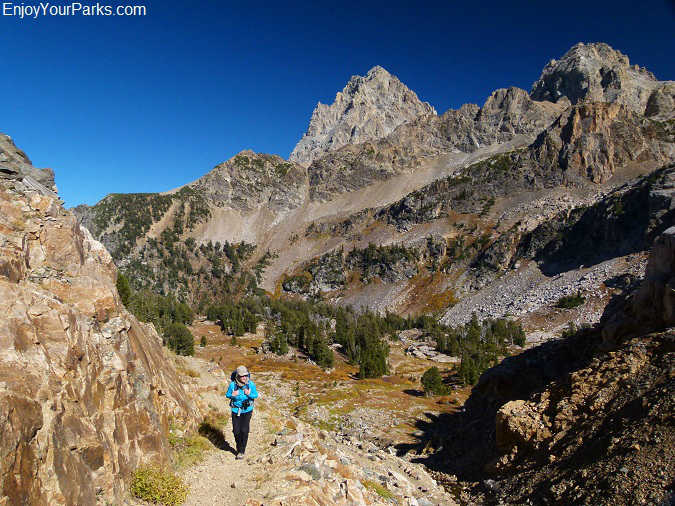 The hike to Hurricane Pass is one of our favorite Grand Teton National Park hikes, and we are confident you will really enjoy it. Even though this is not an easy hike, being 10.9 miles one way with an elevation gain of 3,468 vertical feet, you will be more than glad that you made the effort!